Pack more than just your flip flops for your next trip to Hawaii. The volcanic archipelago of the Pacific is home to some of the wettest, densest, and most beautiful trails that the US offers. From the big city life of Oahu to the laid-back garden isle of Kauai, there’s a trail for everyone. Here are the eight best trails throughout the Hawaiian Islands, and everything you need to see along the way. Oahu is the most visited of the Hawaiian islands, with more than six million visitors swarming to the island each year. Don’t expect your hike to be in solitude, but be sure to bring along your camera for portrait-worthy views. 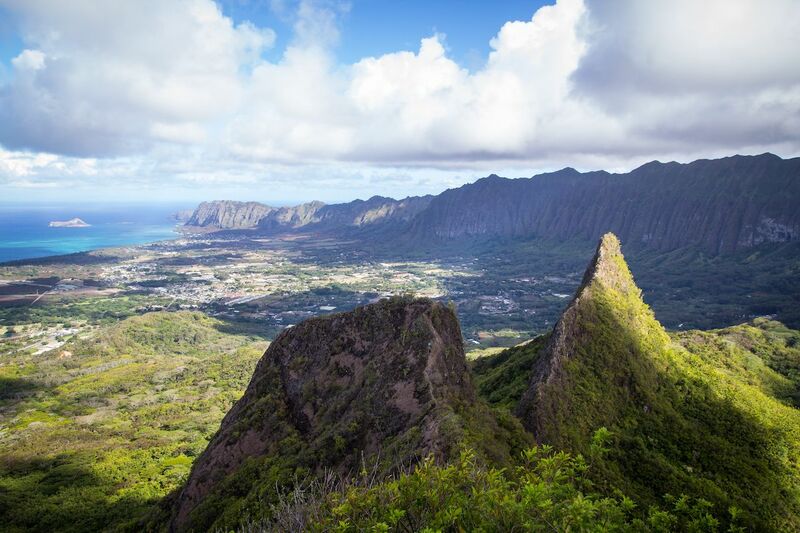 Olomana Trail, which starts on the quieter, beachside town of Kailua, offers three peaks, all of which are a steep, and at times dangerous, scramble. Look for wild pigs that scavenge the muddy forest at the beginning of the trail, then relish in the changing scenery as jungle gives way to an ironwood forest. The heat of the climb comes from the boulder sections, technical enough to require a rope for extra support. The trail stays jungle-covered just enough that your view is mostly obscured until you reach the first climb. Your vista extends out toward the Pacific Ocean where a clear day will give you views of Na Mokulua, two small islands a half mile offshore. It’s possible to continue on the trail to the second and third peaks, but be warned: The trail can be treacherously dangerous in wet conditions and there are several places where a stumble can be fatal. 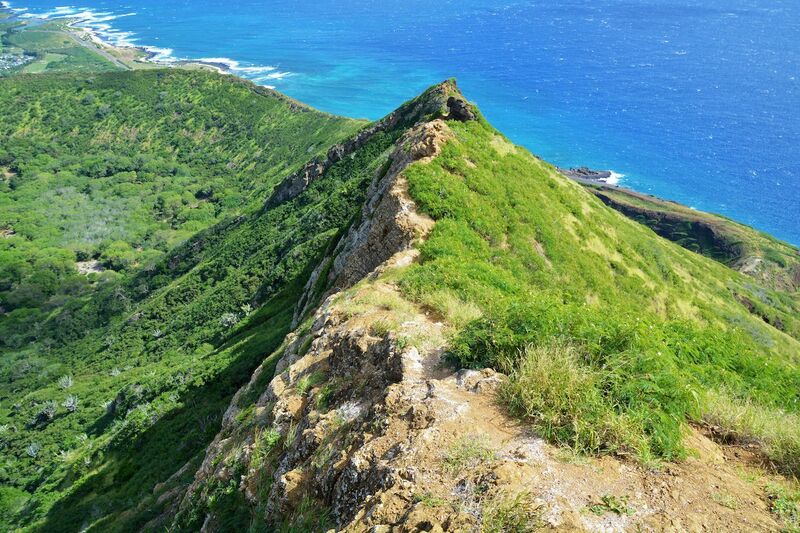 At less than two miles round-trip, it’s easy to write off Koko Head as a walk in the park. But with more than 1,000 stairs, this hike is difficult, in part due to the terrain itself. Your hike follows the Koko Head Railway, originally built during WWII to transport supplies up and down the bunker at Koko Head. As such, each step is awkward as you struggle to keep your foot on the railway planks. Don’t look down — the top section feels almost vertical. Though the hike itself isn’t beautiful, surrounded as it is by dry, scrubby brush, take a minute to cool your heart rate and enjoy the view from the top. Honolulu’s aquamarine waters lay far below. If you’re a serious hiker, chances are you’ve secured a permit to the Kalalau Trail well before you fly to Kauai. 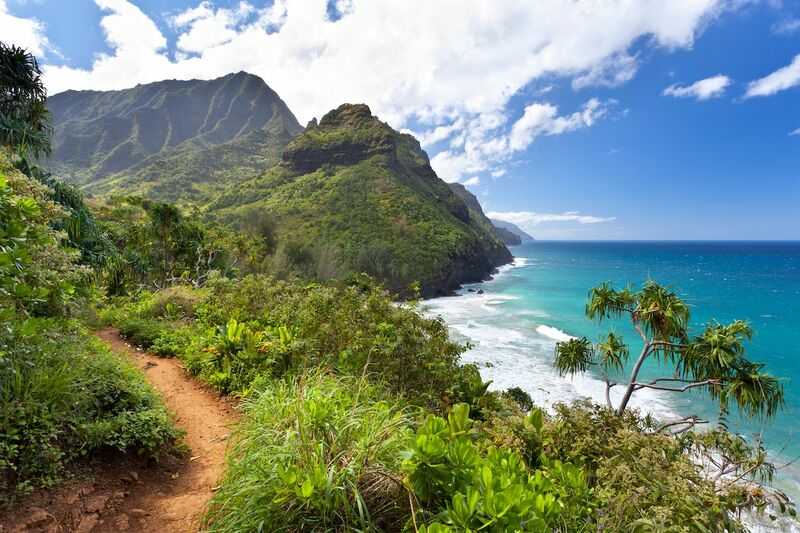 The Kalalau Trail, an 11-mile (one-way) hike along the Na Pali Coast is as good as it gets for strenuous, but rewarding, hiking. The trail begins with a two-mile section of yellow-dirt trail that provides stunning views of turquoise waters. At Hanakapi’ai, turn inland to visit a waterfall or continue on — with the required permit, purchased far in advance — to traverse the hilly cliffside trail. Not an endurance hiker? Camp at Hanakoa, roughly the halfway mark, or continue to the end of the trail at Kalalau Beach. Your bonus? Getting to hike back. As of January 2019, the trail is temporarily closed due to damage from heavy rain, but it will hopefully reopen soon and it’s well worth planning ahead for this bucket-list hike; check the state park website and plan accordingly. Tucked into Waimea Canyon, Alakai Swamp sits more than 4,000 feet above the Na Pali Coast. As such, this rainforest remains damp year-round, meaning that many a boot have been sucked off due to the mud that coats the otherwise green scene. 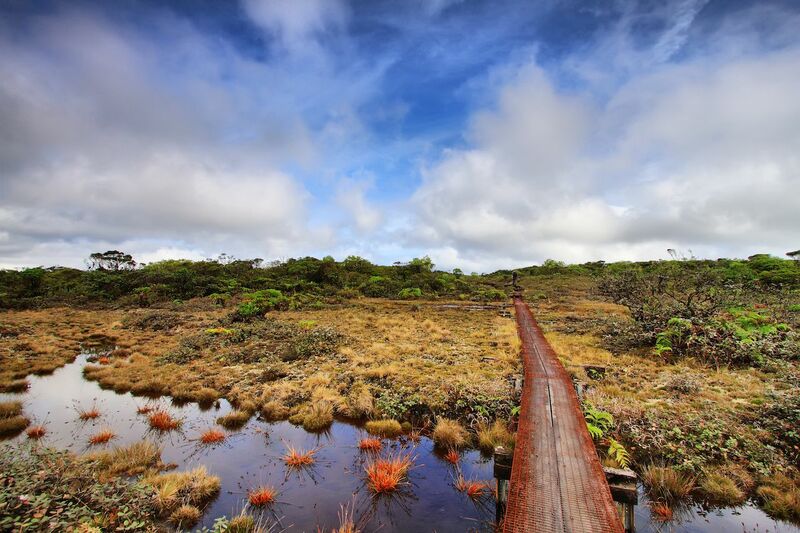 In recent years, a boardwalk has been installed which makes the hike more doable — all the better to get to Kilohana Lookout for a view, if you’re lucky enough to get a clear day. Even without the view the hike is special. Alakai Swamp is a unique “montane wet forest,” one of only three found on the Hawaiian Island with several bird species that can be seen, like the ‘i’iwi, a honeycreeper with a large curved bill. Volcanoes National Park, which sits at the southern tip of the Big Island, once offered visitors trails that traversed craters and lava tubes. Unfortunately, due to Kilauea’s seismic activity and lava flows most of the park was closed for much of last year and several of the best trails are still closed. Nonetheless, the park is not to be missed and continues to offer hiking unlike you’ve seen. 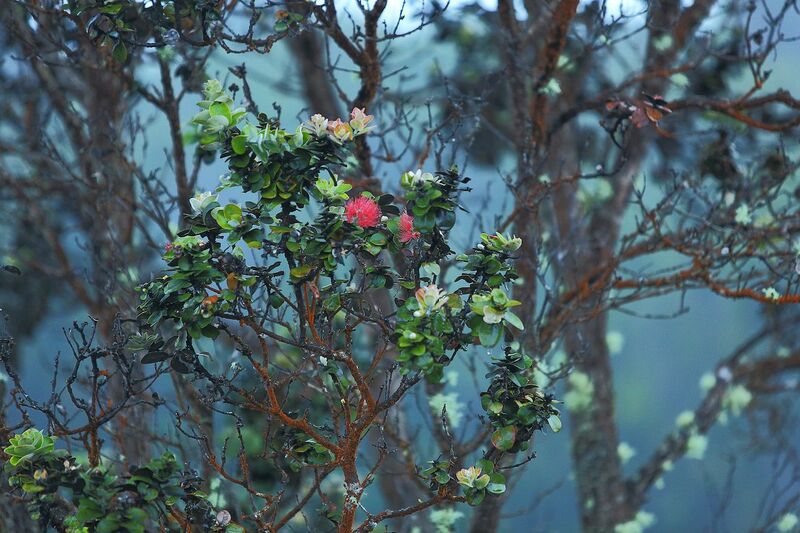 The Kīpukapuaulu Trail — we dare you to pronounce it — features ‘ōhi’a trees, a vital plant for the endemic and brightly colored apapane and akohekohe birds. Bring a pair of binoculars to spot them concealed amongst crimson-hued flowers. At 1.2 miles round-trip, this isn’t a hike that requires endurance, but that’s for the best as you marvel at the thick green canopy overhead. Part of this hike’s beauty is in its contrast to the Kilauea crater. Post-hike, drive the recently opened Crater Rim Trail to witness a scene more evocative of Mars than a tropical oasis. If you’re looking for a short but steep workout, the Waipi’o Valley offers a 25 percent grade — at times up to 40 percent — with one of the most expansive and sacred sites on the Big Island of Hawaii. Located on the Hamakua Coast, on the northern end of the island, Waipi’o Valley has a long history in Hawaiian culture and was the childhood home of King Kamehameha I along with thousands of native Hawaiians; estimates range between 4,000 and 10,000 people. Today the valley is inhabited by just over 100 Hawaiians who continue to work on their loi kalo, or taro terraces. While it is possible to drive down into the valley, we recommend hiking, both for the chance to see wild horses and to eventually wind your way through to the black-sand beach. Rest up: You’ll need it on the way back. 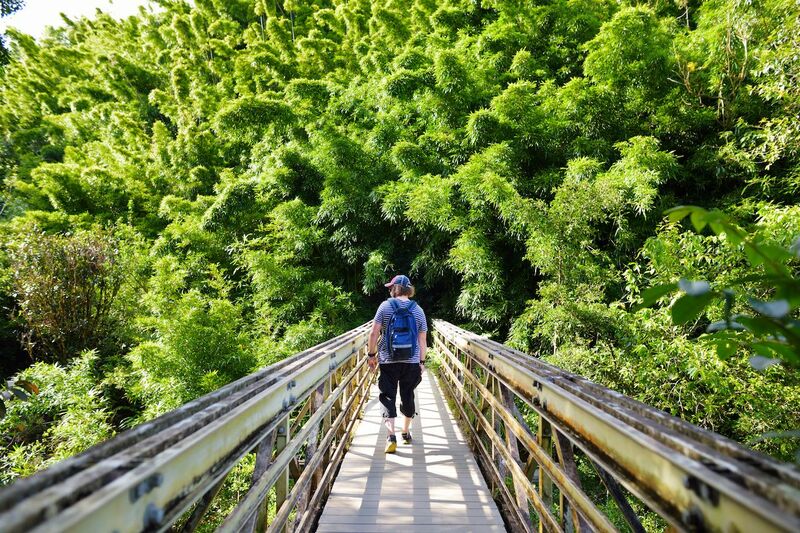 After spending several days snorkeling around Maui, take a break from the sun and head inland to Waimoku Falls and Pipiwai Trail, a four-mile trail that winds through thick groves of bamboo and around tangled banyans in Haleakala Crater National Park. While Waimoku Falls, the final point of the hike, offers 400 feet of cascading blue water, there are several additional waterfalls and streams to see along the way. The trail can get muddy, but lucky for you, a wooden boardwalk has been installed, making for a cleaner — and dare we say more fun — experience. Take the opportunity to visit the Haleakala Crater summit post-hike, savoring the cindered terrain. Sunrise and sunset can be spectacular, but the real show comes at night when the stars look close enough to touch. Molokai, known as the Friendly Isle, is the least visited of the larger Hawaiian islands. Despite much of the island looking arid, Molokai is home to dense old growth rainforest. 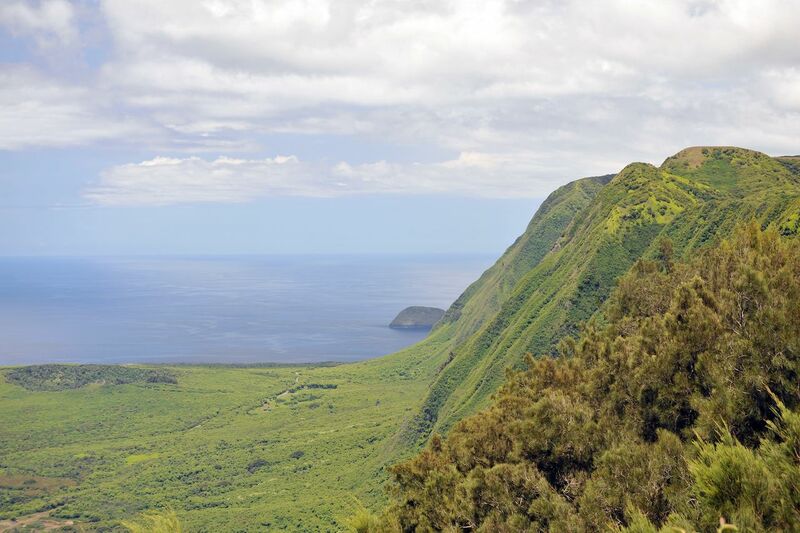 Several of the island’s hikes require guides, but Kalaupapa National Historical Park offers several trails and the chance to understand Molokai’s darker history. Kalaupapa was once a village where those suffering from Hansen’s disease, better known as leprosy, were sent to live in isolation. 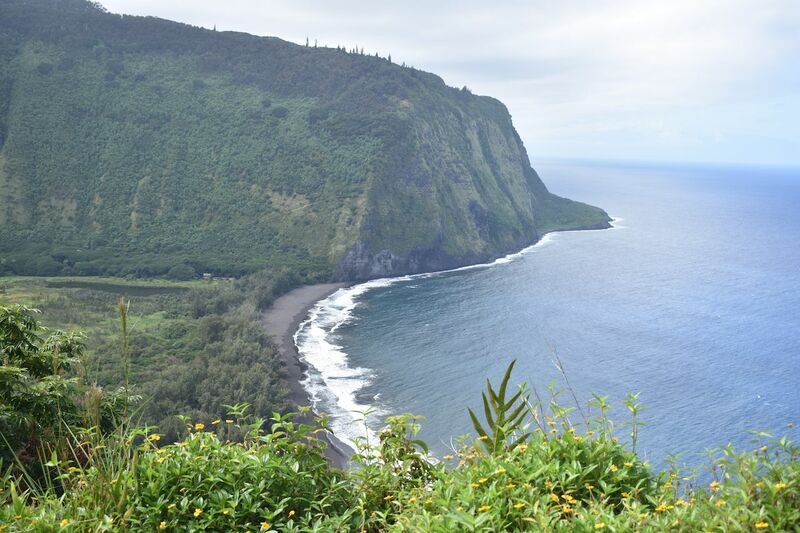 Prior to this, native Hawaiians lived on the Kalaupapa peninsula for hundreds of years. A guided tour will provide you with a required permit as well as the history behind this special place, but you’ve still got a 3.5-mile hike with 2,000 feet of steep descent awaiting.